Are you an avid dog person, but suffer from dog allergy? Well, you are not alone in your misfortune. According to studies, about 10% of the people in the US are allergic to pets. Thankfully, there are some dog breeds which are considered more suitable for homes where there are people suffering from allergies induced by the dog’s hair or dander. Even though there are no dogs which are 100% hypoallergenic, there are certain breeds which have little or non-shedding coats, which means that less hair and dander is released in the air of your home or on your furniture. With the growing instances of children and adults suffering from pet allergies, the popularity of hypoallergenic dogs has been increasing in the last years. Having a dog allergy does not necessarily mean that you can’t enjoy the loving company of a four-legged friend. But adopting a hypoallergenic dog can make life so much easier on you and on your family too. Here are the most common hypoallergenic dog breeds. Tibetan-Terriers are the living proof that hypoallergenic doesn’t always mean having no hair at all. This breed sheds very little hair but does require quite a bit of grooming. The breed originated in the Buddhist monasteries in Tibet. These wonderful fluffy dogs with flat snowshoe-like feet for walking on snow are absolutely charming. They are medium-sized or small dogs with a sensitive, clever and affectionate character. The double coat doesn’t shed too much but they do require regular grooming. They make excellent loyal pets and are quite reliable watchdogs. These gorgeous white fluffy dogs will actually shed very little hair on your furniture and clothes. They are fun to cuddle, play with and to watch as they walk as if they are floating on a puffy white little cloud. You should be careful with the tiny Maltese puppies, especially if you have small kids because there is a risk of hurting them during rough play. As a whole, the Maltese terriers are among the gentlest dog breeds. Then again, they do enjoy playtime and walks, so they are suitable for people with all types of lifestyles. The Maltese are loving, playful and energetic pups which are perfect companions for people with dog allergies. The Shih-Tzu breed is known for its loyalty and friendliness. It too is a non-shedding dog breed suitable for families with members suffering from dog allergies. These small “lion dogs” were bred back in ancient China. They are compact little dogs but have rather sturdy bodies hidden beneath the soft luxurious hair. Yes, the hair will come off, but only when you brush them or when it is broken. The Shih Tzu is a gentle and loving lap dog which can get along with all family members, kids included. In fact, it is quite a loyal and dedicated companion which makes it one of the top preferred hypoallergenic small breeds. These small expressive dogs have become famous stars on TV and in various movies thanks to their cuteness, their human-like facial expressions, and their overall charm. Thankfully for people with allergies, the Brussels-Griffon is another non-shedding dog, which is suitable for people looking for hypoallergenic pets. The Brussels Griffon is a great watchdog, but has a friendly disposition and is great with adults and children alike. The dogs from this breed do tend to bond with one particular person more than with others, but this doesn’t stop them from being one of the most suitable hypoallergenic dogs for any home. One of the most famous dogs from this breed is Bo – President Obama’s dog. The Portuguese Water Dog is a relatively rare breed, but due to the fact that these dogs shed very little, they are becoming increasingly popular among people looking for hypoallergenic pets. They are robust, medium-sized dogs which are very energetic and can work both on the ground and in the water for hours. Apart from the fact that they are strong swimmers which were used to gather fishnets and to send messages from one boat to another, these dogs are incredibly intelligent and very easy and prone to training. This makes them excellent pets for people who love to live active lives and don’t mind spending time playing with and training the dog. The Poodle is one of the most popular dog breeds on a global level for a large number of reasons. It makes this list because this breed is not only hypoallergenic, but it is virtually odor free as well. The harsh curly coats of these sweet creatures need to be clipped or corded regularly. Whether standard, toy or miniature, the Poodle has a characteristic proud and dignified gait, which makes it almost regal like. Poodles are recognized as highly intelligent, trainable and with a comedic streak. They are friendly and sociable dogs which love human companionship and are especially affectionate with kids. Although Westies do shed some of their double coat, they are still considered a hypoallergenic breed. These wonderful small-sized pups are quite active and friendly little terriers. Their body shape, with the short legs and compactness, is highly recognizable. So is their sweet furry white face with sparkling eyes and a button like nose. Westies are happy and curious little dogs, which are very affectionate with their humans. Unfortunately, the breed does not get along very well with small animals, which is something to keep in mind if you have smaller pets. A Westie does make a fun and loving companion though and is a perfect dog to welcome to a home where there are people with dog allergies. The Bichon-Frise is the ultimate hypoallergenic lap dog. It is easy to train, independent and sociable animal. The striking puffy white appearance of the Bichon Frise is due to its double coat which consists of a curly and coarse outer coat combined with a soft and dense undercoat. It doesn’t shed, and with a proper cut, this breed is very easy to maintain and emits little to none hairs and dander which are the main causes of most dog allergies. Overall, this breed is a great pet thanks to its merry character and its agility. It is easy to train and is a playful and friendly dog which will fit in perfectly in a household with people with allergies. If you want a small dog which will always stay close to you and yet won’t trigger your dog allergy, you may want to get a Havanese. These dogs originated in Cuba and are extremely cute, small, short-legged dogs with hypoallergenic double coats. They are very social canines, which have a very distinguishable lively gait. Overall, the Havanese is a quiet and gentle dog but it won’t mind some wild and rowdy play time too. They will always be a step away from their owner and will always be alert if strangers are approaching. You will not have trouble training your Havanese pup, as the breed is very intelligent and attentive. Both varieties of the Chinese-Crested breed – hairless or powderpuff shed minimally and are excellent pets for apartments where people with dog allergies live. The reason is that they do not require vigorous exercise and can live without a backyard. They are friendly with all family members, children, and even with cats. You can train your Chinese Crested pet pretty easily, but remember to use a gentle approach as it is a sensitive dog which is willing to please. These elegant and slender dogs are perfect lap dogs, great companions and are very good with other dogs, strangers, and pets. Scotties have one of the most recognizable silhouettes in the world of dogs. They are compact, short-legged and yet large boned terriers which are the perfect combination of power all packed up in a small package. The distinctive hairy eyebrows and beard perfectly add to the sharp and keen expression of this breed. Thanks to its low shedding double coat, the Scottish-Terrier is one of the top preferred dogs for people suffering from allergies. They are rather independent and quite territorial, but Scotties makes a loyal companion. They are a low-shed breed with a hypoallergenic coat and require minimal grooming which makes them perfect pets. They are always ready for action and are quite fearless. Still, they become strongly devoted and affectionate with their families, and despite being a bit stubborn are great, fun and loving hypoallergenic pets to have. Cairn-Terriers are sturdy and happy dogs which originally came from Scotland. They have a very distinctive outer wire coat which is not only hypoallergenic, but it also repels water too. Another fun fact is that the color of the coat of your Cairn terrier can actually change several times over the years. These short-legged terriers are quite hardy and active. They have wider heads than other terriers and a foxlike face, which makes them one of the cutest terriers around. Although they can be quite stubborn and bold, the Cairn terrier make great pets, as long as you provide them with daily exercise. Keep in mind that the Cairn Terrier is bred to chase vermin, so you may want to restrict it from contact with smaller animals. It does enjoy playing with children, so your kids will be happy with their furry little play friend, and you will be allergy-free if you adopt a Cairn terrier. Since Labrador retrievers are not hypoallergenic, if you are a fan of this breed but suffer from allergies, you can get a cute Labradoodle instead. It is a perfect combination between the Labrador retriever and the hypoallergenic Poodle. It is an active, friendly and exceptionally cute dog, which is perfect for a family pet. In order to make sure that your Labradoodle pup is truly hypoallergenic and won’t shed, ask the breeders whether the parents were low -shedding, and opt for a second generation Labradoodle which has Labradoodles as parents. Once you add a Labradoodle to your household be ready for a lot of fun, games and affection from your new cute family member! The mini and standard Schnauzers are also low shedding dogs which are an excellent option for people with dog allergies. They are amazingly smart, loyal and full of energy. Schnauzers are great watchdogs and are very popular companions due to their hypoallergenic coat and their endless loyalty. They are sturdy, robust and have square-shaped bodies. Since they were bred as ratters, they are very fast and can run at long distances. The specific outer long wiry coat which is especially lengthier on their feet, eyebrows and muzzle make them amazingly attractive dogs. Pups from this breed get along with other animals, enjoy children and are very clever dogs which can be perfect hypoallergenic companions. Yorkies are toy type terriers with long coats, which like many of their terrier cousins shed very little. They are preferred as pets due to their compact size, their hypoallergenic qualities, as well as their charm of course. These tiny terriers are very devoted and loyal companions, which sometimes perceive themselves as large dogs. Their beautiful tan and steel blue coat parts at the muzzle and throughout their entire bodies up to the jolly tails. They get along with older children and with other pets. Due to their small size and their somewhat bold character, you should supervise them with very young children. They thrive better indoors and prefer warmer climates. If you want a hypoallergenic pet which can be both a lap dog and enjoys brisk walks and outdoor games, you should definitely think about adding a Yorkie to your family. The Australian-Silky-Terrier is often mistaken for a Yorkie, but even though they do look alike and both are low-shedding hypoallergenic breeds, there are some differences. The Aussie is a mini working terrier which is quite bold despite its size. It is longer than it is taller, and even though it has quite thin bones is a strong little dog. Its straight silky single coat follows the lines of the body rather than falling down straight to the floor like in Yorkies. The silky terrier is definitely not a calm little lap dog. It is quite playful, curious and always ready for action. Unfortunately, it has the tendency to show aggression to other pets and dogs, but it is a mischievous and clever little fella, which will never leave you bored. 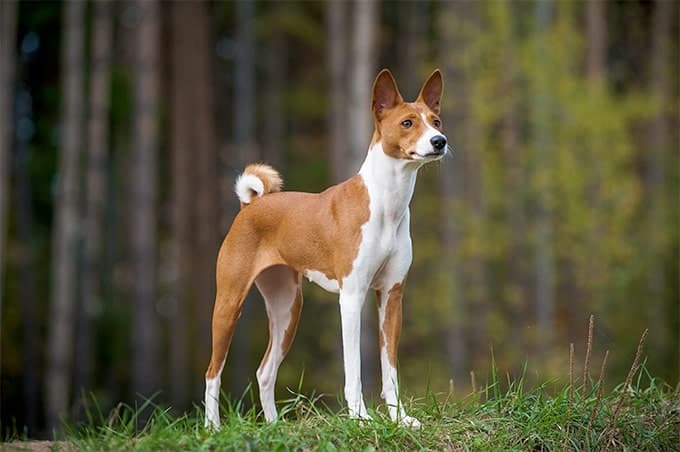 The Basenji is well known for two specific traits – the fact that it doesn’t bark, and also that it likes to thoroughly groom itself like a cat. What you may not know about Basenjis is that they shed very little, require very little grooming, and can make perfect hypoallergenic pets. They are small elegant hunting hound dogs which are quite energetic and intelligent. They can charm just about anyone with their shiny short coats, the curled tails, and the very expressive eyes combined with their cute wrinkled foreheads. If you can deal with the strange howling noise which they make instead of barking, and the fact that they will spend hours grooming themselves like felines, as well as with their need for everyday long walks and exercise, the Basenjis are perfect for people who have dog allergies. If you are allergic to dogs and want a large-sized hypoallergenic dog, you should opt for the King of Terriers – the Airedale. This is recognized as one of the most versatile breeds and is a great hunter, companion, and athlete. It is the largest of all terriers and can reach up to 23 inches at the shoulder. Its wiry dense coat is tan colored with black markings and sheds very little. Airedales are incredibly intelligent dogs, which you can read immediately when you look into their dark eyes. They are very patient with children but being typical terriers, they are determined watchdogs which will do everything to protect you and your home. They are perfect for dynamic people who like long walks, hikes, sports and outdoor activities. The Samoyed is another large dog breed which is suitable for people with allergies. It can thrive well in an apartment but you will need to provide it with sufficient exercise. Its amazing sparkling white, long and thick coat will draw attention wherever you go. The most typical feature of Sammies is their ever-smiling face. Actually, the fact that the corners of their mouths are permanently curved up is due to the fact that they were bred in freezing temperatures in Siberia and is a feature which prevents them from drooling and thus from icicles forming around their mouths. Whatever the reason for this amazing smile is, there is no doubt that your Samoyed will always bring a smile to the face of anybody who sees them. They are not suitable for very warm climates. Overall, they are smart, affectionate and social dogs which can be a bit mischievous, so they will need a lot of love and training. You should definitely establish yourself as the alpha dog if you want to have control over this gorgeous but large dog. The Italian Greyhound is like a gentle miniature greyhound which is a very affectionate, playful and alert companion. Although it is more of a decorative lap dog, it still has the instinct of a hound and has a pursuit instinct. These slender and small dogs have very long, thin legs and sleek curvy lines. This combined with the beautiful coat and the expressive eyes and loving nature makes them perfect pets. Even if you have an allergy, you can still enjoy the company of the Italian greyhound, because it sheds very little which makes it hypoallergenic. It is sensitive to cold, and doesn’t require too much outdoor time, so if you are a couch potato – you should go for this breed. Overall, if you want an elegant, gentle and loving lapdog which will not trigger your allergies, you should get an Italian Greyhound. This is one of the most eye-catching dog breeds. It is aristocratic, but as regal it appearance can be, the Afghan Hound can be quite a comedian as well. Afghan hounds are very loyal, elegant dogs which have silky, thick floating coats. Thankfully to people with allergies, they shed very little, and thus as one of the preferred hypoallergenic dog breeds. These are quite tall dogs, which can reach a height of 27 inches at the shoulder. They are bred for hunting in the harsh Afghan terrains, which is the reason for the huge paw pads which act as shock absorbents. They are not suitable for people who prefer spending most of their time indoors. If you have a yard, or have the will and time to take long walks and spend times outdoors, the Afghan Hound could become your best furry friend. These are some of the most popular hypoallergenic dogs which will not shed and emit too much dander and hairs which can trigger allergic reactions in people diagnosed with dog allergy. Of course, every dog is different, and every person is different, so there is no guarantee that you will not experience any symptoms of dog allergy whatsoever if you get one of these dogs. Thankfully, there are ways to limit the release of allergens and the accumulation of dander and hair in your home. Overall, no dog is completely hypoallergenic, but with the proper precautions taken, allergic people can happily live in the same home as their beloved pet. If you can’t live without a dog companion and have allergies, make sure to pick one of these or any other hypoallergenic breed, so that you can live comfortably together and enjoy each other’s presence and love!